INTERVIEW – BLOOD OR WHISKEY TALK EXCLUSIVE CHRISTMAS SHOW, NEW ALBUM & U.S TOUR. 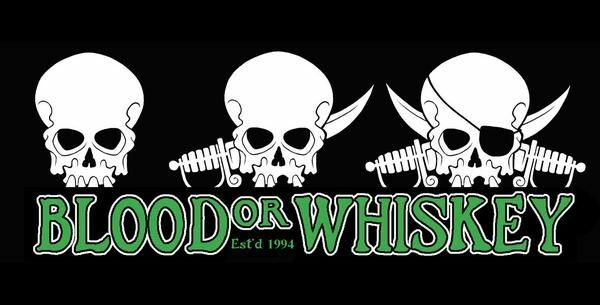 Blood or Whiskey have been slogging it out for the best part of twenty or so years, earning a respectable level of fans from across the pond in America, as well as a small army throughout mainland Europe and beyond. As they prepare for a very special headlining Christmas show in their hometown next month (December 16th) in Dublin’s Grand Social, Overdrive grabbed some time with drummer Chris O’Meara to discuss their forthcoming show as well as their confirmed tour with The Dropkick Murphys in America, next year. 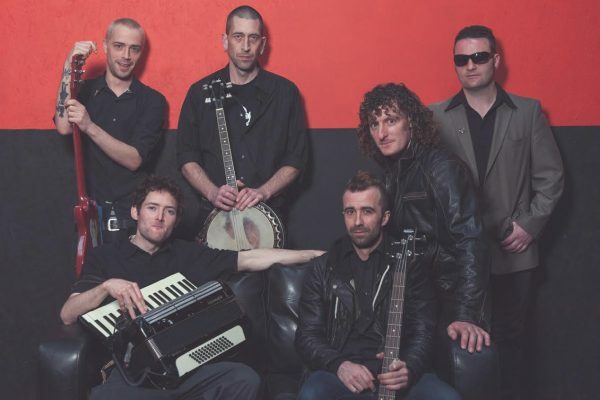 Understandably likened to The Pogues, but the band’s influences lead their sound to be more accurately described as a hybrid of The Dubliners meets The Clash. Blood of Whiskey released 2 EP’s & 4 studio albums (Cashed Out On Culture still widely regarded internationally as an Irish gem and Tell the Truth and Shame the Devil a classic), with 4 tours of the East Coast of America (three with Dropkick Murphy’s), a regular feature at the Rebellion Festival over the last 8 years (Morecambe, Dublin & Blackpool), and a tour of Japan under their belts, other career highlights included; supporting SLF on an entire UK tour, opening for the likes of Manu Chao, Rancid & The Pogues, playing Oxegen (2009), Reading & Leeds (2010), Blood Or Whiskey have covered a lot of ground in their career to date. Now with a new album on the horizon, Overdrive catches up with Chris O’Meara to talk about the band’s forthcoming Christmas show in Dublin’s Grand Social on December 16th and the update on a possible new album. OD – Tell the Truth and Shame the Devil’ came out back in 2014, I know you have been writing for the new album, so how is it all coming along? CHRIS – We have a great deal of material written already and they just need to be worked on a little bit and finalised with lyrics etc before we put them out. It’s definitely time for a new album, so we’re just gearing ourselves up to get it all together. Obviously, the financial aspect is something that is a huge part of it, so we’re just making the right decisions at the moment and preparing ourselves. We are rehearsing every week and to be honest, there is more than enough for an album. Now is the time when we are trying to make it all come together and get the songs ready and put into the right boxes if you know what I mean. I would be confident to say that we might be putting it out by mid-2017. This is all speculation at the moment as we have to get the funds together to make this happen and that’s always a tricky part of recording and putting a record out, especially when you’re an independent band such as ourselves. We know also just how we want the album to sound and need to get the quality to a certain level. We have no interest in doing a cheap album that sounds like crap. We want it to be the best effort that we can give and however long that takes, will be the determining factor as to when it will be finally released. OD – I understand that there is a rather organic process to your writing methods, has there been any particular direct influences that have inspired the current writing process? Will there be any forthcoming singles that you are planning to release ahead of the album and if so what will it be? CHRIS – Well the inspiration for the new material has been mostly from Ska influenced bands. We’re all at our happiest when we are playing fast, upbeat and up-tempo music and that’s why we have always had a love for the old Ska tunes. Don’t get me wrong, it’s not like we are turning into a Ska band, it’s just that when we all get together we all try things in different styles and one of the styles that seem to work with us is that Ska influence. Bear in mind, not all of the new material is Ska influenced, as we have some slower tunes in the mix also. We always try to keep the Irish influence strong in everything that we do. Our very surroundings provide us with the influence that we need to write the songs that we do. It’s the everyday life and the people that we encounter along the way that inspires us to write the music and lyrics. We really try to stay away from the political side of things, but sometimes there are just too many things that we just can’t let slide by. OD – Have you ever considered releasing a series of EP’s rather than an album as most bands seem to be doing these days? CHRIS – We have talked about doing something like that in the past, but for us, we are used to doing things in a more traditional way by putting out a full album, instead of a series of EP’s. We tend to like the idea of a full album, but see the merits of constantly releasing material. There is a considerable amount of material already for an EP or five track release after Christmas and do the same again by the Summer time. That wouldn’t be a hard thing for us to do, but it’s just the mindset that we are in which makes us go with the idea of recording a full album instead. It’s just what we are used to and that process works well for us collectively as a band. Of course, there is nothing to say that this will not change later down the line, but for now, we are just happy to do things the way we have in the past. OD – Having been together in one form or another since back in ’94, with four studio albums under your belt, you have obviously seen a massive change in the way people consume music and in particular the way bands are recording and releasing music. I understand that you decided not to use the crowdfunding approach as most bands seem to be doing now. Is that still something that you firmly stand by? CHRIS – We actually have been keeping an eye on the process of crowd funding and there are certain bands, I won’t mention, but it works for them and that’s fine. Its’ a bit raw for me when you hear of bands that are guaranteed a hefty payment for their live performances and then they are also looking for funding from their fans also. It’s just my opinion but I’m not really about that and don’t feel that the fans should pay to sustain a particular lifestyle for some band’s when they can very well do it themselves. That’s not fair in our opinion. If you just pre-selling the product and offering the fans something exclusive like signed copies of the album or some original lyric sheets, then that’s fine in my opinion. When you start offering yourself out to play in someone’s living room or expecting to get paid to play a birthday party, that’s just odd to me and not the real meaning of playing music or being in a band for that matter. To be honest, I feel that it’s all a bit horrible and jaded when you find yourself having to do stuff like that to keep going. What we’re doing is solid hard work and our bread and butter is the old school way of just getting out there and doing as many tours as we can. It doesn’t feel right to ask for other people to pay for the privileges that we have been given as far as getting founded and then heading off to American for a two-week tour. That is simply not right! We want to achieve everything from traditional hard work and not take advantage of people. OD – I understand that you are back on the road with Dropkick Murphys again next year, you seem to have a great history with those guys. When did you first cross paths? CHRIS – We crossed paths with the Dropkick Murphys back in either ’96 or ’97, I can’t be sure of the year (laughs). Ken Casey (Dropkick Murphys) got in touch with us to do some releases over in Boston and whatever way it unfolded, it didn’t work out and we just stayed in contact ever since. That’s how it developed and we all became friends with the lads and they are just a great bunch of people, who truly care about the music they are making and helping other bands also. There’s a great community spirit over in Boston that they can bring into everything it seems, Those guys are always there to help others. If you notice, you can always see that the Dropkick Murphys have punk rock bands on their bills and that’s stuff they don’t have to do at their level. They could just turn around and let a DJ set up and open for them and the crowd would still be there for the show. They like to keep bringing bands back to help them with exposure and give them a helping hand, so to speak. We have had a great friendship with the Murphy’s and they have been nothing but helpful to Blood or Whiskey since the day we met them. OD – You have embarked on a huge amount of touring in the past, do you find that there is more of an interest in punk / trad abroad rather than at home here in Ireland? CHRIS – Absolutely. There is still a good punk scene in Dublin, with bands playing every other week from The Lee Harveys to Paranoid Visions. It’s really great to see those guys still going and doing what they do very well. But I’ve definitely noticed that when we are out of Ireland and on tour, there is a much wider appreciation for that scene. Mind you, there are considerably more people in other countries than Ireland, so there is bound to be a larger audience interest. We actually never intended to get involved in this ‘Celtic Punk’ scene. That’s not what we intended to do. Our intention was to play music that we really enjoyed listening to and playing. Once we were established then we started getting interest from the punk-rock scene and then the media and fans slowly started to pull us into that genre. To be honest, there was no way of avoiding not getting involved with that whole genre, we just rolled with it all. Over in mainland Europe and American, that whole scene is just massive, particular the Celtic Punk scene. It’s just huge and the fans really love it. It’s actually surprising just how big it really is outside of Ireland. We were in Japan on tour and it was almost overwhelming how big the scene is over there. It’s so rewarding for us to experience that, as it would for any band. 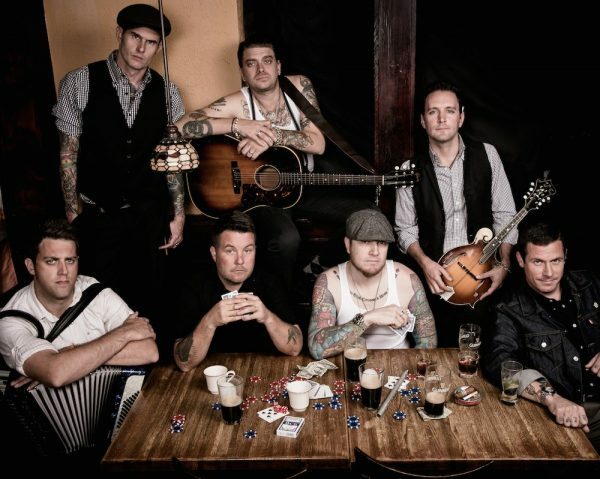 When the Dropkick Murphys played here last year, they did two nights in Vicar Street and both nights were totally sold out. It’s funny that everybody will come out to see an international band doing it, but when we play or some of the local bands, there’s not that level of interest. (laughs) I understand that they wouldn’t have sent that particular band as many times as they would have seen us or some of the other local bands, but there seems to be something almost exotic for the fans when a touring band comes in regardless of the genre. OD – If you could change anything in Ireland at the moment regarding the music scene what would it be such as radio / press etc? CHRIS – I would like to see the music industry and radio stations here in Ireland actually support new and underground music. They say that they do, but the reality is far from it. Take this as an example, Paranoid Visions charted in Ireland a few weeks ago and we still didn’t hear anything on the radio about it. I think they actually go to number 7 in the Irish charts and there was basically no media support from anywhere, which is such a shame. You can be sure that whoever was either number six or seven in the charts was played to death across a series of radio stations. It’s a form of discrimination against music, which is just wrong and shouldn’t be allowed to happen. It just doesn’t make any sense to me and when you see bands like Paranoid Visions, who deserve the exposure – because they are a seriously hard working band getting ignored like that, it’s just outrageous. I’de like to also see the government get involved with radio stations and other media outlets and offer some support to bands in this country. It’s not cheap to be in a band, put on shows and pay for album recordings, tours etc. If the government could offer a certain amount of money to help with things, just like they do in Sweden and Canada. There is no doubt in my mind that Ireland is packed full of budding musicians that simply don’t have the money to buy the instrument they wish to play, or have to lay the band to rest because it’s just proving to be too expensive to keep going. It would be fantastic if the government could set up places for kids who have a great interest in music to go and learn about it and experiment with different instruments. OD – The up and coming show in Dublin next month will be your first show since March when you played The Workman’s Club, have you any special guests lined up for the show? CHRIS – The Grand Social show will be the first show since you played The Workmans Club in March. We are in the process of thinking about the gig and putting the set list together right now. Our focus is fixed on putting the best show together, that we can and we are open to the idea of some possible special guests appearing at the forthcoming Christmas gig. We are hoping to throw in a couple of surprises that night for sure. OD – After the US shows next year, what are the plans for Blood Or Whiskey? CHRIS – Well, when we get back from the U.S tour, the number one priority will be to get the new album underway and set a release date. We also will be reaching out to our agency in America to see what we need to do to progress with things. 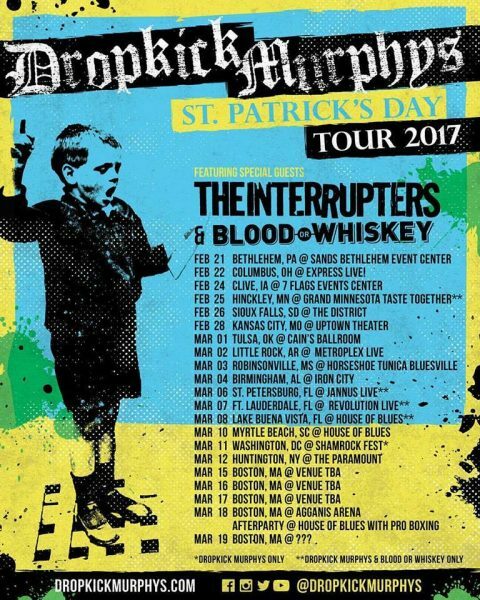 There will be big numbers at each of the Dropkick Murphys shows, so we’re gonna have to figure out about getting back out to American and touring the new album after it’s released. We don’t want to let things get stale and need to keep the momentum moving forward all the time, especially when we are lucky enough to have large captive audiences before us each night. It’s so easy for music to be released in general, but for us, it’s about keeping up a level of quality and that’s what we have always been about, since day one. 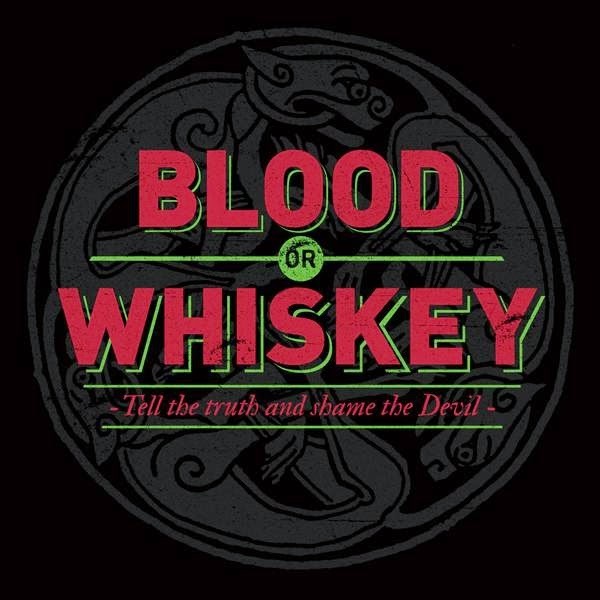 Blood Or Whiskey play Dublin’s Grand Social on Friday, December 16th. Tickets are available from this link. For more information on Blood or Whiskey, please click this link.